I remember I used to play with My Little Pony as a little girl growing up in the 80s. I still have some of my old ponies which I have passed along to my girls. Bridget, my 5 year old, is a My Little Pony fan so you can imagine her excitement about the release of the new My Little Pony DVD! 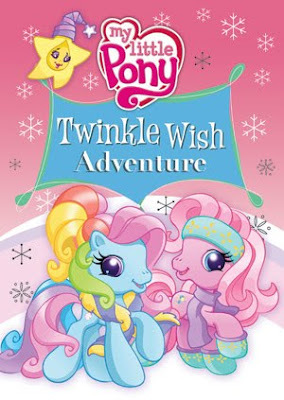 I received the new DVD, My Little Pony: Twinkle Wish Adventure for a review. It comes out on DVD on October 13, 2009 so we were able to see it before it was even in the stores! This new animated feature length movie follows Pinkie Pie and all her pony friends on a fun-filled adventure as they discover that friendship can make wishes come true. It also includes fun extras including a new animated short “Elefun and Friends”, the “Waiting for the Winter Wishes Festival” prequel, six sing-along songs, downloadable colouring sheets, cut-out pony ornaments and four fun activities. Bridget really enjoyed this movie! She loves the ponies and was very excited to watch it. She has watched it a few times already. Her favourite part was singing along to the songs. Its a definite keeper and perfect to keep her entertained. As I mentioned above, this DVD is available in stores on October 13, 2009 and is priced at $14.99. I recommend it to all parents of little girls! My daughter is in Absolute LOVE with My Little Pony. We actually just had a MLP birthday party in April. Her room is full of all things MLP.